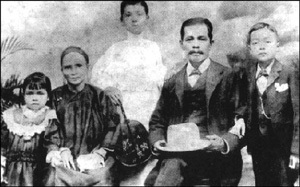 Mr. William Chin Len Kow and his family, one of the pioneer settlers, arrived in Jamaica in 1895. He is one of the three people who bought the Chinese cemetery for the community in 1901 and was a founding father of Chee Kung Tong. The story of the Chinese in Jamaica is linked to Panama and railways. In the mid-19th century, many Chinese looked west: to California, answering the call of the gold rush, and to Panama, where labourers were required for the building of a railroad from Panama City to Colon. Both options promised improvement in their lives and those of their children and led many Chinese to break the law and leave China prior to 1891, the year the Chinese Government officially allowed emigration. The first large group of 267 Chinese immigrants came from Hong Kong on July 30, 1854, just months before those from Panama, on a ship called Epsom. They were destined for indentureship. Later that year, 205 Chinese workers demanded to leave Panama fearing yellow fever. They arrived in Jamaica on November 1 and 18, on ships called the Vampire (195 people) and the Theresa Jane (10 people) respectively. Panamanian authorities sent them to nearby Jamaica solely due to its proximity and in exchange for Jamaican labourers. Many were already ill on arrival and were sent to hospital in Kingston where they eventually died. Less than 50 immigrants survived. Of these, one, Robert Jackson Chin (Chin Pa-kung), opened a wholesale house on downtown Kingston's Pechon Street (where the Desnoes and Geddes building now stands). In doing so he unknowingly paved the way for many of his countrymen. Two others, Chang Si-Pah and Lyn Sam opened grocery stores nearby. All three men provided guidance to successive batches of immigrants. 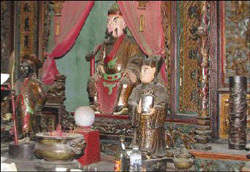 The Altar with the god, Kuang Gung, on the third floor of the original Chinese Benevolent Association building on Barry Street, Kingston. In the past, on Chinese New Year people would go there to pray for good fortune. Courtesy of the Patrick Lee. Taken by Mr Lee, 2002. A decade later in the 1860s another set of Chinese arrived from Trinidad and British Guiana. There they had worked as indentured labourers in the canefields until hurricane and insects threatened their job security. Some 200 Chinese workers answered a call for three-year contract labourers in Jamaica to tend to the American-led large scale planting of coconuts, bananas and sugar. When their three-year contracts were up, some continued in the fields even though they were not welcomed with open arms by the newly emancipated slaves who saw them as competition. Others started small shops of their own where total weekly sales tended to amount to less than £8 on average. By this time, Chinese grocers were becoming known for extending credit to favoured customers, selling by barter, providing round-the-clock service and selling goods in small, affordable quantities. It is as a result of their importation activities that items such as rice, saltfish, saltmeats, flour and cornmeal became staples of the Jamaican diet. In the 1860s, a close-knit Jamaican-Chinese community began to emerge with many living above, behind or somewhere near to their shops. Downtown, a retail area became known as Chinatown. Two decades later, in the 1880s, another group of 680 immigrants arrived ­ this time directly from China. They had been recruited as farm labourers. There were 501 men, 105 women, 54 boys and 17 girls who docked in Kingston Harbour in 1884 after having survived a typhoon aboard the 67 day voyage. Upon arrival, they were claimed by the plantation owners who held their contracts and scattered across the island. Among this group was Chin Tung-Kao, who in 1891 would found the Chinese Benevolent Society to offer humanitarian and social aid as well as protect Chinese customs and preserve their ethnic identity, at 131 Barry Street in downtown Kingston. Following 1885 large-scale immigration of Chinese labourers occurred in an attempt to satisfy the demand for field labour created by the departure of African-Jamaican and East Indian labourers from the plantations. This fourth wave of immigrants totalled close to 700. Some came without contracts and were thus able to choose their occupation, which was generally divided between farming and the retail grocery trade. These immigrants, like many of those who had come before, were not generally well-received by Jamaicans, and so they tended to stick together. There were continual racial slurs, some were held in Spanish town on arrival under armed guard until they were shipped out in mule carts to the various plantations. Built between 1948-51, this building was typical of the Chinese, with business downstairs and home upstairs. Mr. Samuel Kong established his business in 1937 after arriving in Jamaica in 1920. He moved his business into this building in Richmond, St. Mary, in 1951. Here, Mr. Kong sold gasoline for autos and kerosene oil in the front; and grocery, hardware, haberdashery, furniture, pimento and cocoa inside. There was also a bakery to the back. Both businesses are still in operation today. Photo taken in 1970's. Courtesy of the Kong family. In 1888, more than 800 additional Chinese arrived and the Jamaican business community began to get nervous. Fearful that they would lose control of the retail grocery trade, they lobbied the Jamaican Government to impose the first in a set of immigration laws that would make it more difficult for Chinese immigrants to come to the island. The new restrictions went into effect in 1905. Immigrants were now required to register with the authorities and provide a guarantee from a reliable person as to the soundness of their characters. In 1910, new and even harsher conditions were added. Chinese immigrants arriving subsequent to that date had to pay a £30 deposit upon landing and also pass a physical and a test showing that they could write and speak 50 words in 3 different languages. This law made it more difficult but not impossible for already settled Chinese-Jamaicans to send for their relatives. By the mid-1920s the total number of Chinese who emigrated to Jamaica numbered close to 4,000. By 1930, an additional 2,000 Chinese had arrived. In 1931, however, the Jamaican Govern-ment issued a decree that no passport was to be issued to Chinese coming to Jamaica excepting to those under 14 years old who were allowed student permits. This was largely a result of ill-will towards the Chinese who had by this time branched out into laundries, restaurants and bakeries in addition to retail groceries. They were doing well on the island, contributing to national development while providing for the families. In the 1930s, during the labour riots, not surprisingly, many Chinese groceries were looted and robbed, and in some cases, their owners murdered. This decree stood until 1947 when the Chinese consulate (established in the 1920s and largely supported by the Jamaican-Chinese community) in Kingston succeeded in persuading the Jamaican Government to relax these restrictions, remove the quota system that had been placed on wives and children and parents and allow Chinese immigrants to send for their family members. 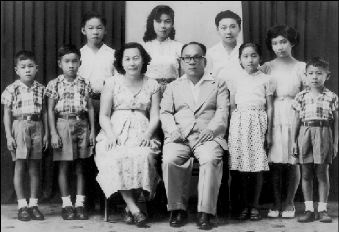 1953, Mr. Samuel Kong with his wife, Wong Fong Yin, and their eight children. Courtesy of the Kong family. By this time, in the 1940s, many of the second-generation, those who were truly Jamaican-Chinese, began to rebel against their parents' desires to remain wedded to Chinese culture. They left the family business, went into other professions and embraced aspects of Jamaican culture. Many also converted to Roman Catholicism. Resentment from African-Jamaicans waned as tolerance of aspects of Chinese culture grew and some amalgamations occurred. One of the most notable examples is the numbers game "drop pan." Drop Pan in Cantonese "Jih Fah" and Hakka "Sue Fah," is named for the fact that tickets numbered 1 to 36 are dropped in a pan to see who wins. Many players play based on dreams and portents, although some play by odds based on a study of the pattern of play. Drop Pan is said to have arrived in Jamaica with the earliest Chinese immigrants in the 1850s. It was restricted by the government as early as 1898. This law was amended in the 1920s due to the game's substantial popularity. Today, drop pan's meanings are most likely both Chinese and Afro-Jamaican in origin. According to Barry Chevannes in a Jamaica Journal article on Drop Pan, "the number 7 means married woman and hog. In Chinese custom a son-in-law makes a gift of a pig or pork to his mother-in-law every New Year. The number 11 means baby boy and dog. Among the Chinese, the dog is a blessing as are newborn males" (p. 46). The number 8 stands for belly, belly (pregnant) woman, hole or ring, all of which could be related to Rastafarian belief that "a woman has no lineage. A woman is only a vessel" (p. 47). Despite some "Jamaicanization," the Chinese have also worked hard to maintain links to their culture. Writers like Anglican priest Easton Lee, explore their Chinese Jamaican roots in poetry and prose. Restaurants continue to offer Dim Sum, the traditional Chinese Sunday brunch, and many supermarkets sell traditional Chinese cooking ingredients. The Chinese Benevolent Society has 5 subsidiary organizations: the Chinese Public School, the Chinese Sanitariam, the Chinese Alms House, the Chinese Public News and the Chinese cemetery on Heart's East Ashley Road. The Miss Jamaica Chinese Beauty Pagaent is no longer held, but many Jamaican beauties of Chinese descent have entered and done well in the Miss Jamaica beauty contests. Winners include Sheila Chung and Patsy Yuen. Chinese holidays such as Chinese New Year, and the Moon and Boat Festivals as well as the anniversary of the Founding of the People's Republic of China, are still celebrated in style if less extravagantly than earlier in the 20th century when they often included dinners and fireworks. Chinese Jamaicans have also made their mark in the political arena with MPs such as Rose Leon, Ferdinand Yap-Sam and Delroy Chuck. Similarly, Chinese Jamaican impact on the business world is far reaching with families and individuals controlling substantial restaurant, bakery and supermarket chains such as Island Grille, Purity and SuperPlus, as well as banks such as NCB. Next year, to celebrate the 150th anniversary of The Chinese arrival in Jamaica, Patrick Lee is publishing his new book "Jamaican Chinese Worldwide - One Family" which will include families from Jamaica, USA, Canada and Britain. "This is an absolutely fantastic series. It is critical that we preserve these for the long term as well as continuing to share with upcoming generations so that they can understand and feel connected to the past and that it continues to have some relevance to their future." - Peter, USA. "This article was heartfelt. I moved away from my home country, Jamaica, as a little girl and have missed out on some of the history that I was to have learned" - Cadiehead, Jamaica. "My son is now learning a great deal about the history of his parents homeland. Please continue with this fantastic educational site." - Sonia , England. "Keep up the good works. It's important that these events and people are chronicled, so that history doesn't die, or get misinterpeted. Remember no history, no future." - Fabian, Canada. "Thoses Proverbs are great. I remember growing in Jamaica and hearing my grandmother using some of them." - Richard, Puerto Rico. A Jamaica Gleaner Feature originally posted September 01, 2003.